The selection of aluminum for a specific use is normally in reaction to an ever increasing demand for an improved strength to weight ratio along with a number of other key property advantages. Rolled aluminum can be presented in several forms including sheets, plates and foils, and is used in many industries adding to the flexibility and its position as a critical material for modern applications. Recent technological advancement in aerospace, automotive, marine, construction and leisure industries has made the demand for materials having high strength to weight ratio, high specific modulus, good corrosion resistance and good thermal conductivity to be on the increase. Aluminum and its alloys offer such combination of tremendous properties. The processing of aluminum alloys from casting to end product is associated with a large number of metallurgical phenomena. In order to further improve and optimize process routes and alloys, a thorough understanding of the thermo mechanical treatments by experimental observations and physically based modelling is necessary. Rolling is a mechanical process involved in many metals processing operations. Rolled aluminum products are essential materials for our daily life. Thick products are used as structural members for rail cars and aircraft, and thin products are used as packaging materials such as aluminum cans and aluminum foils. Rolled products, i.e. sheet, plate and foil constitute almost 50% of all aluminum alloys used. In North America the packaging industry consumes the majority of the sheet and foil for making beverage cans, foil containers and foil wrapping. Sheet is also used extensively in building for roofing and siding, in transport for airframes, road and rail vehicles, in marine applications, including offshore platforms, and superstructures and hulls of boats. Also, while relatively little is currently used in the manufacture of high volume production automobiles, it is expected that the next decade will see sheet used for both space frames and body panels, a market that could easily match the 2 million tons now used for beverage cans. Plate is used for airframes, military vehicles and bridges, ships superstructures, cryogenic and chemical vessels and as tooling plate for the production of plastic products. Foil applications outside packaging include electrical equipment, insulation for buildings, lithographic plate and foil for heat exchangers. 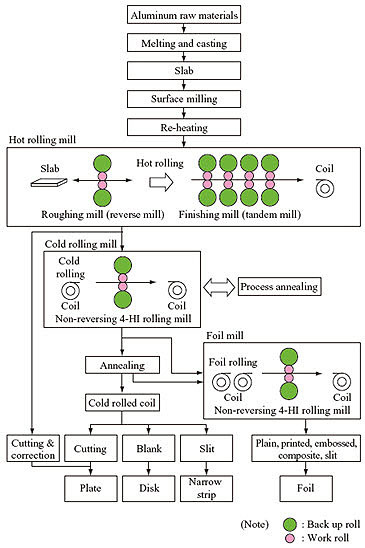 Figure 1 presents the manufacturing processes of rolled aluminum products. Rolling equipment is roughly divided into three kinds; namely, hot rolling mills, cold rolling mills, and foil mills. Usually, rolling is performed by applying a load to the materials by forcing them vertically through a pair of work rolls. The work rolls are deformed by the high load during the rolling process. Consequently, the shapes of the rolled strips are distorted. In order to address this problem, one or more back up rolls are installed above and beneath each of the work rolls in order to curb the deformation. This entry was posted in Aluminum. Bookmark the permalink.